Games are great at evoking emotions. You could think about something like Outlast and think about the horrors you experienced exploring its world. That Dragon, Cancer is always there to break your heart. Wandersong is one of those games. Its emotion is unbridled joy. While there is a fair share of drama here, it is this incredibly positive force in the video game universe. It is here to make you happy, and I can’t imagine feeling anything else when spending time with this merry musician. The Bard isn’t a hero. They’re pretty much considered a silly little bird by most people in their hometown. But they want to make a difference. They think they have something to offer. And, when an agent of Eya contacts them in their dreams, they have a chance. The world is about to end. It is not because people did anything wrong or some great evil is present. The goddess just makes a point of scrapping universes after certain periods of time, then creating something entirely new. It is just this universe’s time. But, The Bard isn’t ready to accept that. They want to help keep everything and everyone they love alive. Fortunately, they have a chance. There are Overseers in this world, each with a part of the Earthsong. If all pieces of it are collected and sung, Eya can be reached and the world can be saved. And, based on how things are going, The Bard is the only one that can accomplish it. Which means a trek around the world, making friends and dealing with a surprising foe that has their own approach to handling things. 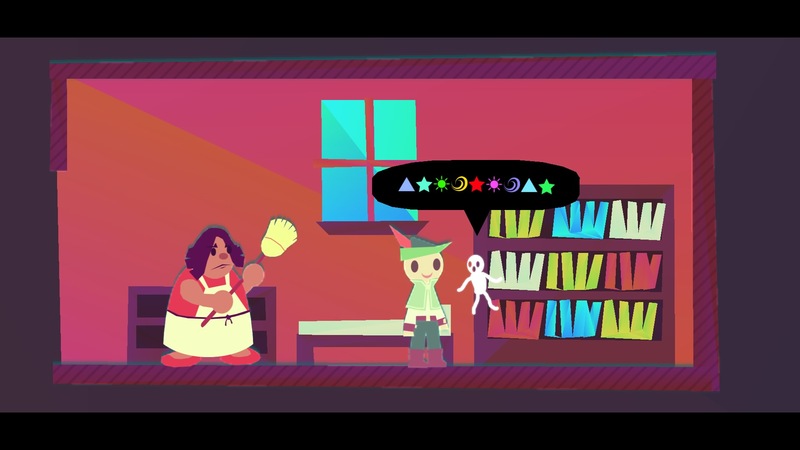 At its heart, Wandersong is a puzzle game. Except here, you aren’t looking for obscure items or worrying that an item you dropped from your inventory two chapters ago is suddenly going to be the one thing you need to unlock the ultimate challenge. As long as you have a song in your heart, you will be fine. The right analog stick and its notes will get you through anything. Sometimes, you will pick a response to a question by singing a certain note. When you collect different Overseers’ Songs, the game will automatically show you which notes to choose. You might even use The Bard’s voice to make plant platforms grow in certain directions or direct winds you can ride upon. Music is very versatile. As are the actual cues that show you what to do. Wandersong takes place in a colorful world, and each of the notes you can sing with the right analog stick has a certain sound assigned to it. But what if you have to have the sound down on your TV? Perhaps the person playing is colorblind. What happens then? Wandersong takes that into account. Each of these actions has other onscreen indicators that let you know what you are supposed to do. You might see a certain effect, like a breeze, blow in the direction you need to go. There might be an actual icon on the next note to hit. It is all very obvious, but not in a way that makes it feel as though your hand is being held. Rather, it is an artistic accent. It is visually appealing, while also making things more clear. The only fault is that sometimes, switching between some notes can be a little tricky. See, all eight of the notes are assigned to the right analog stick. With platforming challenges or segments where The Bard is answering questions, this is no big deal. These sections aren’t typically timed and you can afford to be leisurely and exceedingly cautious with your inputs. However, when The Bard has to play through actual songs, sometimes swiftly switching between notes can make it difficult to hit the proper pitch. This is less of a issue as you go on. After a two-hour play session, it wouldn’t prove much of a problem. But when you’re just finding your footing, it might cause some trouble, especially since Wandersong isn’t a game that otherwise holds your hand. Beyond sometimes teaching your to dance, it tends to leave you to work problems out on your own. Wandersong is a game that is a master of influencing your emotions. It starts out very subtle. The Bard is this optimistic character who is easily excited. They often are complimenting other people, telling them how great they are. They’re altruistic, helping out other people even when someone like Miriam is trying to get them to hurry up and move along on the quest. Their first reaction to everything is kindness, and even when faced with the opponent that is very decidedly seeking a different and more violent course of action, they believe the best about people. It is only as we start to move through Wandersong that we see there is a greater depth here. The Bard isn’t as 100% positive as they may seem. Miriam may seem critical and cynical, but there’s a reason for her hesitance and attitude. Everyone here might look two-dimensional, but they have three-dimensional personalities. There is a sense of growth as people hit walls, face the realities of the world, and come to realize that things may not always be as positive as they might seem. But, because we have this foundation where we are coming from an optimistic place, there is still hope. 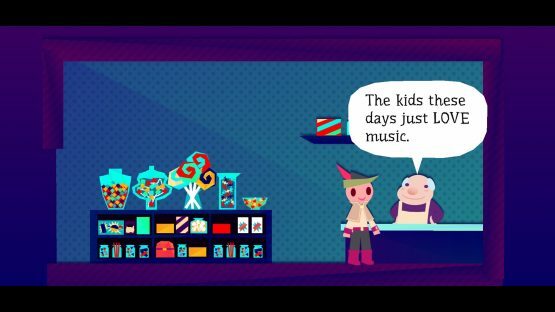 Wandersong‘s avatar is still a positive force in its universe. A few roadblocks don’t diminish the things that have already been accomplished. It doesn’t mean you still can’t find an better future. The setbacks we do face make us appreciate the brighter moments even more. 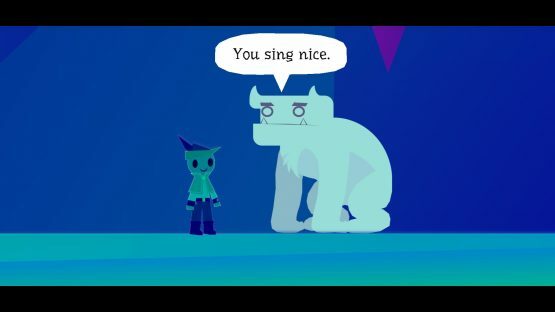 Wandersong is the video game equivalent of a pep talk. This is your virtual cheerleader. Are you having a bad day? The Bard believes in you! Are you worried about being you? The Bard is your friend and will be there to hear you out. Having trouble solving a problem? Well, I mean, singing a jaunty tune probably won’t suddenly make things right, but it might improve your mindset. Wandersong is one of the most pleasant and refreshing games out there. Even when the going gets tough, the goodwill garnered here will help you push through and enjoy another day. Wandersong review code provided by publisher. Version 1.00 reviewed on a standard PlayStation 4. For more information on scoring please see our Review Policy here. Decidedly optimistic and occasionally quite silly. Its inputs work in such a way that even someone who is colorblind or has the sound down could still solve every puzzle. Sometimes transitioning between two notes with the right analog stick can result in the wrong note being selected.